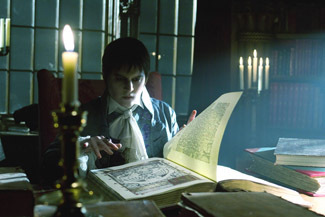 Dark Shadows could rightly be described as a comedy, a drama, a horror movie and a thriller. And yet, given all these identifiers, it lacks a clear identity. It’s a mix of genres blended into one nonsensical movie. How, exactly, did director Tim Burton want us to perceive it? Obviously he wanted it to work on all levels, but which one did he want it to work on first? Had he answered that question, he might have brought some much needed direction to the unresolved screenplay and made a working picture out of what’s essentially a mess. The movie is based on the cult 1960s soap opera and stars Johnny Depp as Barnabas Collins, son of wealthy Liverpudians who immigrate to America in 1760 and start a fishing empire on the coast of Maine and build a town called Collinsport. As a philandering teenager, Barnabas breaks the heart of one of the family’s live-in servants, Angelique (Eva Green), who happens to be a witch. She exacts revenge by killing Barnabas’ parents and placing a spell on his one true love, Josette, who throws herself off a cliff. When Barnabas tries to do the same, he discovers Angelique has turned him into a vampire and the townspeople subsequently confine him to a coffin for the next 200 years.